On Thursday, Dec. 31st. 2009 my wait was finally over. It was a beautiful, wintry evening with a hint of snowfall in the air. The weather this winter was not a factor. The building looked inviting and a warm glow shone through the windows as I approached the well worn, old cemented steps up to the main floor which houses the dance hall. By the way, this building has one of the best dance floors in our area thanks to the workmanship of the hard-working Finnish craftsmen. After placing my coat into the coatroom, I walked into the hall. It was pleasant, warm, tastefully decorated and inviting. The mood was electrifying. People were happy and glowing. I could feel the anticipation perhaps for the dinner, the music, and the door prizes or was it for the midnight celebration? I wondered to myself what is to come for the next 100 years for this wonderful, old building. I found my table and friends with whom I would enjoy my evening and noted that everyone was happy. The hors d'oeuvres were out of this world. As I waited for the dinner to be served, I had a chance to enter my name into the guest book for all the 100th anniversary events for this year and visit with friends and first time visitors to chat about the coming evening. The celebration crowd was a wonderful mix of young and old. 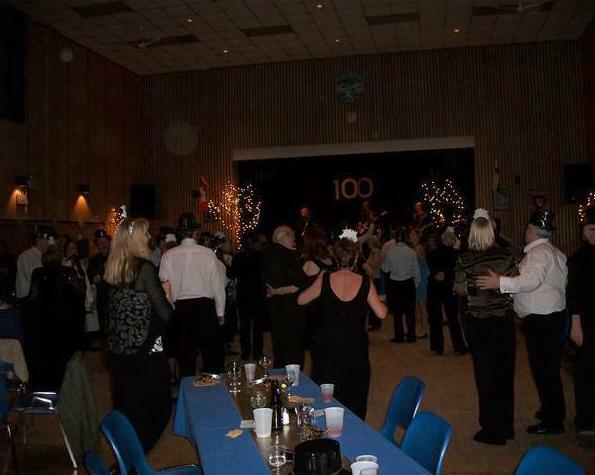 The important thing was they were all there to have a good time and to support the 100th Anniversary of the Finlandia Club building. During a very delicious dinner and dessert there was a lot of conversation about the future of the building. Soon after dessert and coffee I could feel the excitement grow. The band, 21 GUN FUN was preparing to come on stage. It was worth the wait! The music was versatile. The accordion rendition of "IN THE FINNISH WOODS" sounded terrific. Dan Johnson was the young man who played the accordion. The dancing was enjoyed by all; young and old. At midnight, we all toasted with a glass of champagne. At this magic hour, everyone greeted each other with a "HAPPY NEW YEAR!". Many hands were shaken; many kisses were planted; many hugs were shared. This is what a New Year's party is all about; togetherness, laughter, enjoyment, happiness, and looking towards the future with many hopes and dreams to be fulfilled. I realized that next New Year's Eve the building will be into the second hundred years of the life. This is a lasting monument to Finnish immigration to this district. This NEW YEAR of THE CENTURY party was memorable not only because it celebrated a milestone for the building, but because of the warmth of the people who were there, the delicious food and the catering, the fantastic music and the prizes won by many. Even the weather treated us with a glorious winter night. Many days have been spent talking about the party, looking at the photographs and reminiscing. Let's all agree to go party again in the grand old building! Thank You for making New Year's Eve 2009 such a beautiful evening.